To paraphrase Douglas Adams on the universe, Crossrail's Elizabeth line project is big. As he put it, you just won't believe how vastly, hugely, mind-bogglingly big it is. Europe's largest infrastructural project, the new 100km railway for London and the South East runs from Reading and Heathrow in the west, through 42km of new tunnels beneath London, to Shenfield and Abbey Wood in the east. The project integrates new and existing infrastructure, and includes the design and construction of 10 new stations and an upgrade of 31 existing stations. There are now eight new underground stations in central London and two new above-ground stations. The scale, engineering complexity, logistics and coordination issues are indeed mind-boggling. Design synergy, including for the lighting, was therefore essential: logistically and aesthetically, the lighting concept for the central London stations needed to be line-wide. Just to add to the challenge, the design team – from a consortium comprising Atkins, Grimshaw, Maynard and GIA Equation (lighting design) – was appointed 11 years ago, which meant some serious forward-thinking was necessary. The universal adoption of LEDs, for instance, would now be an obvious solution but a decade ago was less of a certainty. However, by working with LED manufacturers, OEM suppliers and luminaire manufacturers at an early stage in the process, the design team was able to accurately predict how the LED lighting products and solutions were likely to develop and evolve over the subsequent five to 10 years. 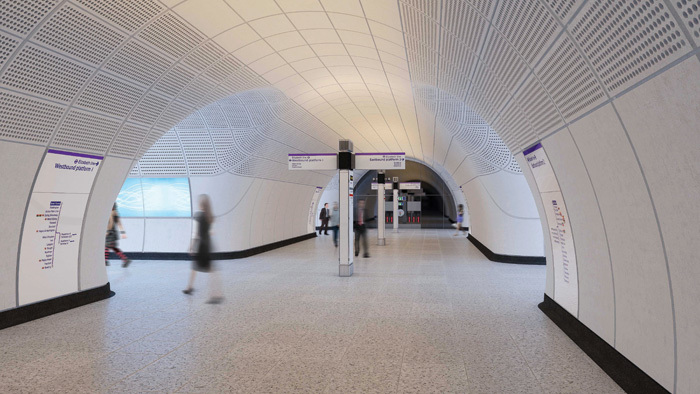 ‘This gave the client team confidence to go ahead with completely LED-based lighting installations throughout the Elizabeth line,‘ says Miller. Between 2009 and 2011, the GIA Equation design team, together with Atkins, Grimshaw and Maynard, developed bespoke lighting design solutions (RIBA Stage F1 level) for the underground public areas of the central London mined stations. These were then implemented by each station contractor. It is an environment where health and safety are clearly critical, and where highly serviceable lighting is a major priority when thousands of passengers have to move through the space efficiently, safely and quickly. However, the lighting concept is more holistic than the utilitarian schemes implemented in the past. Navigation, lit appearance, glare avoidance and seamless integration, along with ease of maintenance and replacement, are all factors which have been considered alongside the more basic functional aspects. The tunnel diameters of the sub-surface stations are 75 per cent larger than the London Underground standard, and twice as long. These extended platforms, with possible exits in different areas from each station location, meant that orientation was a particular challenge. Lighting became instrumental in helping intuitive wayfinding, especially at peak times when passengers move in large pulses, whether going from concourse to platform or disembarking from a train and seeking an exit from the station. Conceptually, the different public spaces in sub-surface stations are classified as either 'wayfinding' spaces or 'transit' spaces. Wayfinding spaces are defined as areas where there are multiple activities taking place (such as reading signage, customer information displays, identifying entrances and exits, and in larger spaces). Transit areas are single-activity spaces, where there is direct movement along a fixed route defined by architecture, and in smaller, linear architectural volumes. Visibly different colour temperatures for the lighting within adjacent spatial types helps promote this intuitive wayfinding. 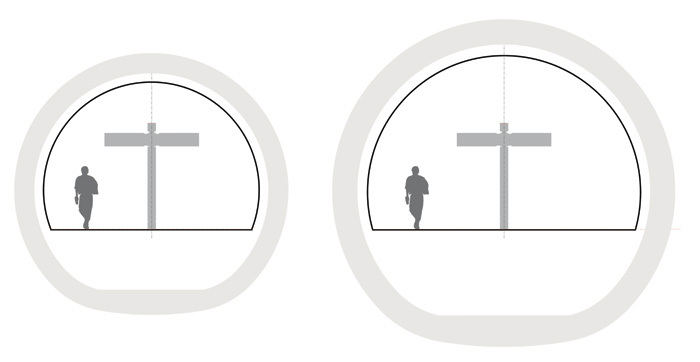 Cool white (5000K) is used for areas classified as transition spaces while warm white (3000K) is applied within the wayfinding areas. Using indirect lighting within the concourses, escalator tunnels and platforms emphasises the interior public areas rather than drawing attention to the luminaires themselves. The light grey, matt-textured GFRC cladding of the underground environment is illuminated with indirect light which creates a sense of spaciousness and an elevated ceiling for passengers, staff and other users. Part of the strategy was to get away from the tyranny of downlighting. Traditionally standards and guidelines are based on the amount of light falling on horizontal task surfaces and at ground level. However, it‘s now recognised that the human visual system processes vertical surfaces within the visual field more easily and more often than horizontal planes. Good vertical illuminance has therefore been prioritised throughout to improve facial recognition of fellow passengers, make signs/customer information more legible, and improve the detection of potential obstacles and hazards. Integration aids design clarity in an environment that needs to avoid visual confusion where possible. The various luminaire components are carefully merged into the architectural design. Services, lighting and other technology elements are grouped together and separated from other fixed components, such as cladding systems. Light fittings are integrated into architectural details such as the iconic, freestanding 3m-high structures known as totems (also housing loudspeakers and signage elements) in the lower concourses, or are mounted flush within cladding elements, such as the cross-passage service boom. The rigorous integration of linear lighting elements not only fulfils the architectural intent of creating an environment that is simple to interpret, but also helps with maintenance and replacement – luminaires and other lighting equipment have a shorter design life than the surrounding fixed architectural components, such as the GFRC cladding. 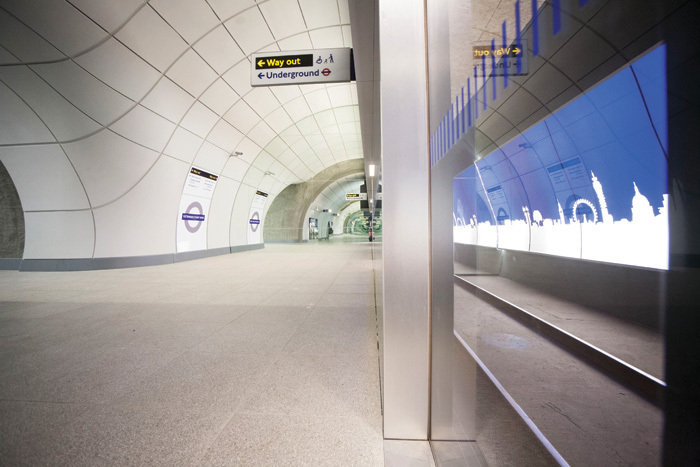 Custom luminaires were developed by Crossrail to meet the lighting performance specifications as suitable off-the-shelf products were unavailable. While there is a universal language to the lighting, each type of interior space is treated individually. 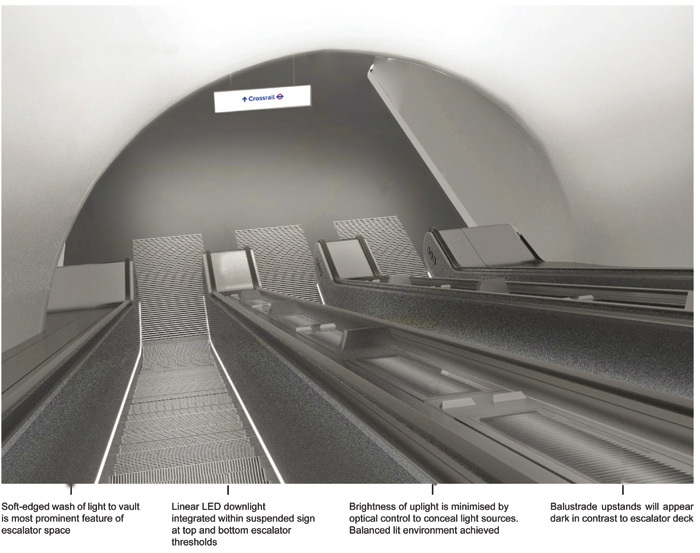 The lighting scheme for the escalator tunnel was developed as two discrete elements. Functional lighting for the escalator steps was initially to be from uniformly illuminated side panels, but during the design and build phase, this was replaced by visually continuous escalator skirting lighting. This lights the escalator itself and is coupled with indirect lighting of the vaulted escalator tunnel, using deck-recessed linear LED uplights. Designated as a wayfinding space, the lower concourse is illuminated by warm-white, indirect light (3000K) provided by the totem-mounted uplights, which wash light up on to the vaulted concourse soffit to provide ambient light. ‘Providing sufficient lumen output from the uplights to achieve the required levels of illuminance within the concourse was a significant challenge,‘ says Miller. To avoid potential glare to passengers travelling down the escalators into the lower concourse (who might glimpse the top of the totems), an integrated louvre system was installed within the uplights nearest the base of the escalators. There are five standard cross passage types, all lit by a visually continuous service channel with integral linear diffuse LED luminaires mounted flush at the apex of each cross passage. Mounted end-to-end these are periodically interrupted by speakers and CCTV cameras. The platform lighting comes from a linear system of modular luminaires mounted on the platform edge screen (PES), developed as a services wall with fully integrated lighting, ventilation, signage, customer information systems, cable management systems, speakers and line maps. Each luminaire module is 1.5m long with a 1.5m-high luminous section. This is uniformly diffuse (a perfect Lambertian surface), reflecting primarily on the upper section of the vaulted ceiling and providing direct illumination on to the platform surface. Lighting is also used as a visual communications device. Train arrival, and passengers boarding and alighting, are indicated by tuneable white colour-changing linear LED luminaires recessed into each door head within the PES structure. These are synchronised with the opening of the platform screen doors, changing from warm white when the PES doors are closed, to cool white when a train arrives at the station. 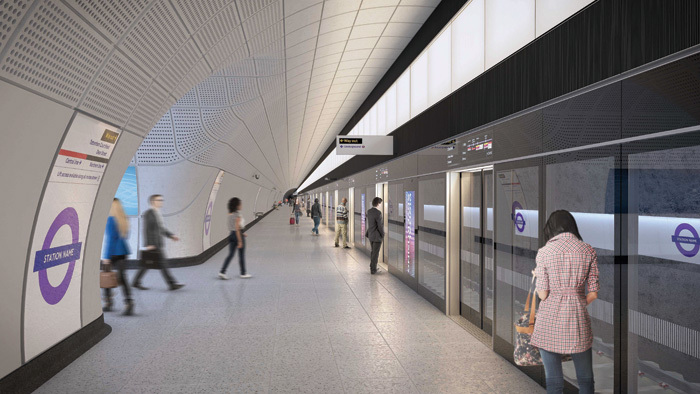 As London Underground, the world's first sub-surface rail system, marks its 155th year, the Elizabeth line exemplifies a coherent, coordinated design approach that puts the passenger at the centre. Practical issues such as minimising luminaire replacement and maintenance costs were central aims, but rather than the stark functionalism of some transport schemes, the overall approach focuses on people. ‘Passenger comfort and experience has been at the forefront of key decisions and innovations, and the resulting design creates a quality experience for those moving through the station environments,‘ says Miller. 'The approach to the lighting has undoubtedly created visually comfortable spaces with fewer shadows and veiling reflections. It enhances the legibility of the space and promotes intuitive wayfinding.